Filler injections will make the area look smoother and younger, with less of a demarcation between the cheeks and the lower face. Many patients are concerned about the appearance of their nasolabial folds, even from a very early age, and this concern intensifies over time. They can be concerned about the fold, or the wrinkle or both. There is debate about whether nasolabials should be filled. Those against filling the nasolabial fold argue that the nasolabial is mostly caused by volume loss in the cheeks, causing loss of structural support for the cheek, causing it to “fall down”, creating the nasolabial fold. So they see the nasolabial as a symptom of volume loss and believe that volume in the cheeks should be replaced, which is treating the cause, rather than treating the symptom, which is the deepening appearance of the nasolabial fold. Where we sit on the debate: In practice, it is very easy to fill a nasolabial fold and the patient does appear younger after this treatment is performed. BUT if that person has volume loss (which they invariably do) then filling the nasolabial fold is not recreating this person to look like their younger self. It is just filling in a fold. The other point is that it takes significantly more product to fill a cheek than it does to fill a nasolabial fold. So there are budgetary issues to consider as well. Also, too much product may be required in the cheek to reverse a nasolabial fold, and this can create an unnatural pillow-face appearance. Our recommendation is to treat both the cheek and the nasolabial fold to obtain the best appearance, in these circumstances, if it fits into the patient’s budget. If the budget doesn’t allow for all treatments then cases should be assessed individually to see whether treating volume loss or the fold will make the biggest or best and most natural change to the person’s appearance. We use several different types of nasolabial fold filler. We cannot use their names due to Australian regulations, which makes it difficult to talk about how they compare to each other and the pros and cons of each. Reversible dermal fillers are safe and well tolerated, with great results. For nasolabial folds dermal filler with a larger particle size, or lifting capability is useful, but in older patients with thinner skin, a smoother filler may be required. Biostimulators are also an excellent choice for the nasolabial fold. The dose required for nasolabial fold filler is variable, it depends on the patient’s anatomy, and where the patient wants to get to in terms of results. The doctor will assess the nasolabial folds and decide on the best dose after taking a history and examining the patient. If a patient has a history of complications with dermal fillers, or if their budget is small or if they want a more subtle result, then a smaller dose might be chosen to start with. Review at 1month after treatment. If nasolabial fold adequately filled then treatment should be at 6 months, 6 months then yearly. If at 1 month review results not adequate another 1ml of dermal filler will be injected, with another review at 1 month. A numbing cream (eg EMLA or LMX or compounded topical ) may be applied to the area prior to the nasolabial fold filler treatment (45 minutes prior is ideal) Glad wrap may be used over the numbing cream to increase its effect. If a cannula is used, local anaesthetic is used prior to the cannula being introduced into the skin. What happens during the nasolabial fold filler treatment itself? Necrosis: (blood vessel being blocked, interfering with blood supply to the skin) is very rare. This could lead to scarring. Need for further treatment: It may take several syringes of product to get to where the patient wants to be with nasolabial fold filler. What to expect after the nasolabial fold dermal filler treatment? The effect of the nasolabial fold filler will be obvious immediately. What if I get asymmetry at some time before the 4 week review? Do I call the doctor? Cost is per syringe. Our most commonly used dermal filler, cost is from $750-$800 per ml. 1ml is used per session. It is important, especially from a preventative point of view, to reduce the smile lines around mouth. These lines which occur on smiling and are more vertical, in the lower cheek area, are sometimes called “accordion lines”. The best treatment to reduce these lines is dermal filler. These lines are adjacent further outward on the face than the nasolabial folds, the lines from the nose down to the corners of the mouth. These nasolabial folds should also be treated with dermal filler. Treating the accordion lines in the lower face is vital at an early age, the reason is that once these lines become moderate to severely etched, they become very difficult to treat. The problem with these lines are that they are coming from so many different areas. They are affected by midface and lower face bone and soft tissue loss with ageing, and they are also affected by skin ageing from multiple causes and from the repeated smiling expression on our faces. What can we do to prevent these lines forming? What if they are already etched in? The above preventative treatments should be performed urgently, as they are only going to get worse, which gets more difficult as time goes by. 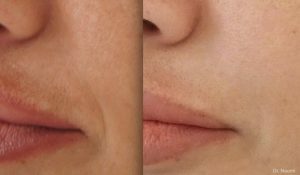 What dermal filler technique is used? For the injecting down the dynamic lines themselves, I use a combination of fern technique and also just getting the filler directly into the lines to lift them along their whole length, done really old school, like we did in the days of Collagen. Cost of the filler treatment? If volumising is required, then this is going to be the expensive bit. If skin boosters are used (which I highly recommend for prevention!) then the cost is about $450-$750 per ml. 1-2 mls will be required. If dermal filler is used for injecting down the smile lines themselves, 1 ml can go a long way with the fern technique, so the cost will be starting from $750.